Disney, Sooner football, and Gary England. out in me at the moment. Say "hey" while you're here! "Lord, I intend it to thy glory, and let no profane misinterpreter abuse it to thy diminution." "I must study politics and war that my sons may have liberty to study mathematics and philosophy." "You have enemies? Good. It means you've stood up for something." "I would rather have a plain down-right wisdom than a foolish and affected eloquence." "The foolish and wicked practice of profane cursing and swearing is a vice so mean and low that every person of sense and character detests and despises it." "Country music is about new love and it’s about old love. It’s about gettin’ drunk and gettin’ sober. It’s about leavin’ and it’s about comin’ home. It’s real music sung by real people for real people, the people that make up the backbone of this country. You can call us rednecks if you want. We’re not offended, ’cause we know what we’re all about. We get up and go to work, we get up and go to church, and we get up and go to war when necessary." "The most dangerous predator of liberals is the real world. They hide from it in college campuses." "To educate a person in mind and not in morals is to educate a menace to society." "Only amateurs say that they write for their own amusement. Writing is not an amusing occupation. It is a combination of ditch-digging, mountain-climbing, treadmill and childbirth. Writing may be interesting, absorbing, exhilarating, racking, relieving. But amusing? Never!" "A liberal is a man too broadminded to take his own side in an argument." "I'm a Christian first and a mean-spirited, bigoted conservative second, and don't you ever forget it. You know who else was kind of "divisive" in terms of challenging the status quo and the powers-that-be of his day? Jesus Christ." "Feminism has nothing at all to do with being 'feminine.' Feminine means accentuating the womanly attributes that make women deliciously different from men. The feminine woman enjoys her right to be a woman. She has a positive outlook on life. She knows she is a person with her own identity and that she can seek fulfillment in the career of her choice, including that of traditional wife and mother." "Tolerance is the virtue of a man without convictions." "It isn't going to bed with a man that proves you're in love with him. It's getting up in the morning and facing the drab, miserable, wonderful, everyday world with him that counts." "I owe nothing to women's lib." "The first thing we do, let's kill all the lawyers." "We're all born pessimists. It takes effort to be optimistic." "True religion and true philosophy must ultimately arrive at the same conclusion." "There's no limit to what a man can do or where he can go if he doesn’t mind who gets the credit." "If a woman like Eva Peron with no ideals can get that far, think how far I can go with the ideals that I have." "What I felt like saying was, 'I've produced my third child and my sixth book since I last saw you. Aren't either of these things more important, more interesting, than my size?' But no - my waist looked smaller! Forget the kid and the book; finally, something to celebrate! Maybe this seems funny or trivial, but it's really not." A man died for me today. "[Judgment] comes from four sources: God, nature, diligence and conversation. Serve the first, and the rest will serve you." "I think political correctness is a wonderful fad. Probably not as spiritually uplifting as the hula-hoop, but undoubtedly better for the health." "Our God and soldier we alike adore. At the brink of danger, not before. After deliverance, both alike requited. Our God's forgotten and our soldiers slighted." "The way to tell the professional writers from the amateur writers is that the amateurs only write when they feel like it." "Remember that only in cheesy romance novels is the heroine guaranteed to find true love without the risk of vulnerability or pain." "We do not fear censorship, for we have no wish to offend with improprieties or obscenities, but we do demand, as a right, the liberty to show the dark side of wrong, that we may illuminate the bright side of virtue." ~ from "The Birth of a Nation"
"Doesn't matter what the press says. Doesn't matter what the politicians or the mobs say. Doesn't matter if the whole country decides that something wrong is something right. This nation was founded on one principle above all else: The requirement that we stand up for what we believe, no matter the odds or the consequences. When the mob and the press and the whole world tell you to move, your job is to plant yourself like a tree besides the river of truth, and tell the whole world - No, you move." "While God doesn’t promise tomorrow, he does promise eternity." "War is an ugly thing, but not the ugliest of things. The decayed and degraded state of moral and patriotic feeling which thinks that nothing is worth war is much worse. The person who has nothing for which he is willing to fight, nothing which is more important than his own personal safety, is a miserable creature and has no chance of being free unless made and kept so by the exertions of better men than himself." "I sought for the greatness and genius of America in her commodious harbors and her ample rivers, and it was not there. In the fertile fields and boundless prairies, and it was not there. In her rich mines and her vast world commerce, and it was not there. Not until I went into the churches of America and heard her pulpits, aflame with righteousness, did I understand the secret of her genius and power. America is great because she is good, and if America ever ceases to be good, America will cease to be great." "I’ve got two daughters who will have to make their way in this skinny-obsessed world, and it worries me, because I don’t want them to be empty-headed, self-obsessed, emaciated clones; I’d rather they were independent, interesting, idealistic, kind, opinionated, original, funny - a thousand things, before ‘thin’. And frankly, I’d rather they didn’t give a gust of stinking chihuahua flatulence whether the woman standing next to them has fleshier knees than they do. Let my girls be Hermiones, rather than Pansy Parkinsons. Let them never be Stupid Girls." Politics and morality are inseparable. And as morality's foundation is religion, religion and politics are necessarily related. We need religion as a guide. We need it because we are imperfect, and our government needs the church, because only those humble enough to admit they're sinners can bring to democracy the tolerance it requires in order to survive. Live each day to the fullest. Live each day with enthusiasm, optimism and hope. If you do, I am convinced that your contribution to this wonderful experiment we call America will be profound. The dustbin of history is littered with remains of those countries that relied on diplomacy to secure their freedom. We must never forget...in the final analysis...that it is our military, industrial and economic strength that offers the best guarantee of peace for America in times of danger. We will always remember. We will always be proud. We will always be prepared, so we may always be free. Last month, one of the most amazing things happened. Well, several amazing things happened but one in particular. I threw away my contact case. First of all, I'm not going to talk dollar figures. Why? Because there's no nationwide standard. It would be like trying to find a house in Manhattan based on what I tell you the going rate is in El Paso. If you live in El Paso and seriously want more information along those lines, then we can chat via email. And the pictures you see (except where specified) are not mine. I couldn't exactly take my camera into the proceedings. Credit is at the bottom. Finally, this will not be brief. Like I said, I'm going to give all the information I wish I could've found out there, so bring a snack. Back in September, Labor Day weekend, my grandmother died. I wrote about that. I also mentioned she lived the majority of her adult life legally blind. My mother also had poor eyesight. And that continued with me. I'm the only one of my siblings who needs (needed) visual aids. After my grandmother died and the estate was distributed, my mom called me and said she wanted to use part of her portion to give me Lasik. See, my mom had hers done back when I was in high school. Ever since, she has wanted me to do it, too. I was too freaked out by hers to ever seriously consider it. Of course, that was ten years ago. Before ten years of feeling contacts in my eyes every day. Ten years of only updating the prescription in my glasses every few years because, on top of contacts, it's just so darn expensive. Ten years of waking up legally blind. I'm overwhelmed. Obviously. At first, I really didn't consider it. It just seemed like too much, too big a gift to accept. I certainly didn't deserve it. But she insisted, and the search began to find a place to get it done. The first thing you have to decide when you start to look at getting Lasik (or PRK) is which procedure you will have. Most people qualify for a couple, I was able to choose from most any of them. The difference in procedures is in the technique and the pricing. Traditional Lasik is the kind my mom got - where an optical surgeon (there's probably a more official term) actually makes the incision in your eye with a tiny razor so that the laser can get to your lens. Yeah, I just shuddered writing that. 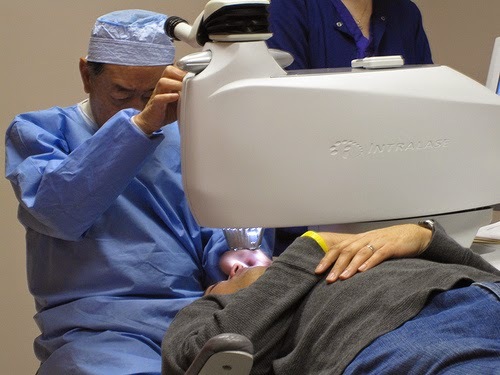 I chose to do what they call "Custom Lasik," which is pretty much all automated, bladeless, and only involves lasers. I mean, this is my eye we're talking about here. I wanted the full Star Trek experience, allowing as little room for human error as possible. It turned out (or, I had forgotten) that I could get it done through the optometrist on post. No, not through the Army, sorry millies. We don't qualify. (p.s. Tricare doesn't cover it, either.) But my optometrist, a civilian, was part of a network of doctors and surgeons here in the city who all operate out of the same surgery center. So I went for my consultation. Actually, I went for a couple. And called even more places. I go in and find out that, yes, I am a candidate, they offer a military discount, and - oh by the way - they've got a surgery opening next week, does that work? Thankfully, I had stopped wearing contacts a couple of weeks prior to that, because in order for them to even do testing for Lasik, you have to have been contact-free for a minimum of two weeks. All I could think was, "Wow, next week." So, we agreed. And honestly it was probably good that it all happened so fast, so I didn't have a lot of time to sit around and dwell on it. The next week was filled with eye appointments where I had pictures taken of my eyes on all kinds of different machines - including a procedure where they dilated my eyes with chemicals so intense, my eyes didn't go back to normal for 2 days. Basically, these tests and pictures drew little electronic maps of my eyes, inside-out. Then they would load those maps into the surgical computers, and from those maps, the machines would be able to perform the procedure with almost the click of a button. That might freak you out, but it was music to my ears. I have to say, I am so glad I went with the optometrist I did. Dr. Caballero and his staff were wonderful, they answered every question and I could think of and more. He took an hour one day and sat with me and SoldierMan and went over everything - the step-by-step of the procedure, what I would see and hear and what they would say, even what strange noises the machines make, so I wouldn't be anxious when they made strange noises. We talked about the recovery, and the long-term follow-up. I'm sure my overall feelings about the process are due in large part to Dr. Caballero. Finally, the day arrived. I didn't sleep at all the night before, which I expected. I can never sleep the night before something new and exciting/stressful. SoldierMan took half a day off of work so he could drive me to and from the appointments and do puppy-wrangling while I recovered. We get to the surgery center, which was very nice and looked more like a law office than a medical office, and sign in. The receptionist hands me a glass of water and a pill - my complimentary Valium. Yes, you get a Valium as soon as you walk in the door. I needed it. I was really tense. Within 5 minutes, it was working. I was still nervous, but I was relaxed. Then Dr. Cabellero comes, in scrubs, and takes me to the back. He tells SoldierMan to stay in the waiting area, so I assumed we were going to do another test. Dr. Caballero introduces me to the surgeon, whose name I can't recall. Then they put me in a chair in a dimly lit room and rub disinfectant all around my eyes. Next, they drop anesthetic drops into my eyes. Yes, just a local anesthesia, drops in my eyes. Then they dilate my eyes super-wide again. And wait for a few minutes for all the drops to take effect. About that time I realized, "Oh, we're having surgery now, not more tests. Okay then." Yay, Valium. A few minutes later, Dr. Caballero takes me into the surgery room. It was also very dimly lit. There were several nurses (or attendants?) as well as the surgeon. I couldn't see anything, not having my glasses. One of the nurses walks up to me and says, "We have a little teddy bear here if you'd like to hold him. There will be points in the procedure when you will feel discomfort and want to squeeze your eyes together. That's not good, so instead, you can hold Teddy and squeeze him instead, if you want." "I want," I said. Or something like that. P.S. if they offer you a teddy bear, take the teddy bear. Trust me. I laid down on a bench like at a dentist's office, between two huge machines. I think there were a half-dozen people standing all around me at this point. Someone, I assume the surgeon, puts a cover over my right eye. Then they put what feels like a soft plastic gel ring around my left eyeball, holding my eyelids back and my eye in place. They lubricated my eyes, since I couldn't blink. I was still able to move it slightly, which was necessary, but not a lot. For each of these steps, the surgeon explained to me what he was doing and why he was doing it. They rotate me under one machine, and I pull the teddy bear into my stomach. "It's okay, just relax," I hear a couple of voices say. There's conversation going on throughout this whole time, but it's in low voices. It was a very hushed environment. The only time someone spoke in a normal tone was when they spoke to me directly. "Okay, now the machine is going to cut the flap in your cornea." I knew how that was going to work, because it was explained to me in one of my consultations. A small apparatus with a flat bottom about the size of my iris was lowered until it was just touching my eye. Then he said, "Okay, here we go." And the machine began to push firmly on my eye, presumably flattening the surface. Then the laser created a flap like the lid of a can of green beans, with a small hinge on one side so they could pull it back to get inside my eye. This was, by far, the worst part of the whole procedure, on both eyes. I felt an odd combination of intense pressure and suction. The machine pushed down for, well, it might have been a whole minute. I was drugged up so my concept of the passage of time wasn't really reliable. But let me tell you, I squeezed Teddy. One of the nurses started rubbing my shoulder gently and saying, "You're doing great, just 30 more seconds.....20 seconds....almost over...." and I appreciated that. You can do anything for 30 seconds, if you know there's only 30 seconds left. As uncomfortable as this was, it was not painful. I want to make that very clear. It was unpleasant, yes, but it didn't hurt in the slightest. The anesthetic drops they used did the job perfectly. Finally, the machine released my eye and they rotated me about a foot over to the other machine. Here, the surgeon again lubricated my eye, and he folded the flap the first machine had made back. That was freaky. I went from sort of being able to see the machine a couple of inches above me to....not. I barely saw the flashing red light that indicated the point of the laser. "Okay, now we're going to turn on the laser. Just keep looking at the little red light." Then I heard the machine rev up. It sounded like it had a big four-banger engine right next to my head, just like Dr. Caballero told me it would. I'm glad he explained so much to me beforehand. 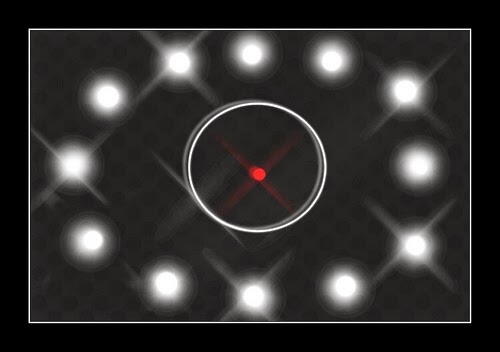 Then the machine stops and I can mostly see the little red light, when before I saw only a blur. The surgeon then folds the cornea flap back over my iris, applies some lubricant - and be still my heart, I CAN SEE THE MACHINE. I wish I could describe that moment to you, where I suddenly realized, oh my gosh, it worked. It really worked. Not that I ever doubted it would, but believing and seeing (literally) are two different things. Then they repeated all the steps on my other eye. The machines did their jobs, Teddy got the stuffing squeezed out of him, and the surgeon closed the flap and lubricated my right eye. They pulled the plastic ring off and rotated me until I was between the machines again. The next thing I remember, Dr. Caballero takes my hands and helps me sit up. "How are you doing?" he asks. "I can see you!!" I may have been giggling at that point. Everyone else in the room started laughing. They probably hear that a lot. They gave me my heavy-duty sunglasses and I walked into the waiting area. SoldierMan looked up, surprised. Apparently I had only been gone about 10 minutes or so. "Are you done?" "She's all done, she did fantastico," Dr. Caballero says. "Now go home and sleep, take some Benedryl or something tonight to help you sleep, and we'll see you tomorrow." "Okay, thank you!" I was positively giddy. I could see...everything. "I can see that license plate! I can read the sign! I couldn't see that tree before without my glasses!" It became a game, probably spurred on by the Valium. Yay, Valium. I went home and went straight to bed. I slept for a couple of hours. Then I got up and started my eyedrop regimen. I was given four kinds of eye drops, each to use at different times, for different lengths of time. I needed them the first couple of weeks. I haven't needed them since, for which I'm very grateful. Women, especially, have a tendency to develop severe, chronic dry eye after having Lasik. Looks like that skipped me. I couldn't bathe for 48 hours. I was driving a couple of days later, even though I don't think I was technically supposed to. I had to sleep with, basically, a ski mask over my face for the first two weeks, so that the flaps wouldn't accidentally get rubbed in the middle of the night and tear off (yikes!) I couldn't wear makeup for two weeks. I had to be careful not to let the puppies get up near my face and accidentally whack my eye (they're big puppies that play rough, what can I say?) because the flaps on my eyes took a while to heal. I'm still getting used to not having to take my contacts out when I go to bed. Now, just over a month later, I have slight night halos, but I can drive at night just fine and see wonderfully. My left eye is something like 20/15. My right eye is getting there. It takes about three months before your vision fully develops and settles, they say. Every day it gets a little better. A few days after the surgery, SoldierMan and I were in the city and I looked out across downtown. "You know, " I said, "Before, even with contacts, I couldn't see those buildings over there completely clearly. There would be some slight double-vision going on. But now, I can." A week ago, I threw out the boxes of contacts in my drawer I had never used....and will never use. Part of me felt bad just throwing that money away, but there was no point in keeping them. It's not like anyone else could use them. I still have my glasses. I've had those since I was a teenager, and they're a little more difficult to part with. So, that was my Lasik experience. If you get the chance to do it, by all means, do it. Yes, it's totally freaky. Yes, it's expensive. But it's so worth it. If you have any other questions, I'll do my best to answer them. Mark already has his paperwork filled out to have the army do it...he can't wait!!!! I'm so glad you had a good experience!! Yay for seeing clearly!! I want to have that done so bad. I don't get out of bed without putting my glasses on. I will admit though reading everything freaked me out. Eeeek! I'm so happy for you and I totally get the "I can see THAT!" feeling, but I'm still not sure I'd be able to do it. I think the whole eye flap thing would be the worst part for me. I agree that it's a chore wearing contacts/glasses, but I see perfectly with my contacts. In fact, my vision is 20/15 when I wear them. But I also wear RGP (hard) contacts, which give you a more realistic view (for lack of a better word). The trick with the RGPs is that not everyone can wear them. I'm incredibly fortunate that I can. Before I got them (when I was 16), I had to get new contacts/glasses every 8-12 months. Since then I've had ONE new prescription. And I don't have to buy contacts every year. I've been wearing the same pair of contacts since maybe a year before we got married. Maybe that's one of the reasons I don't think I could do Lasik... I see so well with my contacts! Also, something I've wondered about people who REALLY can't see without contacts/glasses, how do you get used to being able to see everything when you go to bed? I almost think that NOT being able to see after the glasses are off helps me go to sleep - no distractions. I thought when the laser reved up, it was like going into hyperdrive on Star Wars. I told the dr that and he laughed out loud! My vision is not as bad as yours was, but I've still seriously considered this for quite a while now. I've had my "new eyes" for over 3 years now and wouldn't change it for the world. I LOVE IT. My left eye is 20/15 and my right eye is 20/20 with some slight astigmatism they couldn't fully correct (that's ok for me, I'm left eye dominant and don't wear glasses anymore!) Best decision I ever made. Thank you so much for sharing this, I'm going in for a consult in January or March with hopefully getting scheduled in May or early June for lasik. I'm so thrilled to hear you had such a wonderful experience. My eyes are not as bad as yours sound, but I'm anxious to get the process started. Good luck on your continued recovery! Wow! I always wondered how the whole process worked, and now I know! LOL. Congrats on having it done girlie and it turning out great! I have considered it but I don't think my eyes are to that point yet...However, I can tell they get worse every year, even with my ocassional glasses...The pregnancy certinally hasn't helped either:) So happy for you and thanks for posting!! Lasik is amazing and my hubs was set for it but they recommended PRK instead. Not at all to be confused for Lasik. His recovery was horrible, he was in a lot of eye pain for almost 2 days but he said he’d do it again if it meant crawling over glass. Me always having had great vision didn’t get the emotion of opening your eyes in the morning and being able to see. He had his several years ago. He’s had better then 20/20 since! Thanks for sharing! I've been too scared of it to even seriously consider it, but it sounds like it's definitely worth the small amount of discomfort. Congrats on being able to see! Thanks for sharing your story! I've had LASIK too and we had almost identical experiences. It still makes my knees weak and shaky to read about it, but I tell people all the time it was the best financial investment I've made. I was lucky that my vision insurance covered 25% so I paid about $3,500. A small price to pay for waking up and seeing the clock for the first time since I was a child. It sounds like you had a great experience! I can't wait to get Lasik. Hopefully I can in the next few years. I was nice and didn't turn on word verifications. Please reciprocate by having your reply-to email set and not posting anonymously. It should go without saying that everything I write here is my opinion and doesn't reflect any official attitude or position of my husband, the US Army or the US government. But I'd be willing to bet I'm in agreement with the majority of Americans, at least most of the time. Blog Design by Freeborboleta Designs. Powered by Blogger.